What Effects Does Coke Have on Teeth? About 1.2 billion servings of Coke were distributed daily in 2003, according to Forbes.com. Concerns about soft drink health have lead many schools to eliminate sodas from beverage machines and cafeterias, and dentists are warning both children and adults to steer clear of sodas. A study published in the October 2001 issue of "the Journal of Dental Nutrition" linked soda to dental decay in adults older than age 25. A Coke contains more than 9 tsp. of sugar. Bacteria that live inside your mouth eat sugar, producing acid as a result. This acid begins to erode your tooth enamel around the bacterial colony, allowing the bacteria to move into the eroded areas and eventually leading to cavities. The time it takes you to finish a soda can increase or decrease the total damage done to your teeth, according to Dr. Laura Palmer of the Tufts University School of Dental Medicine. It only takes 20 seconds for bacteria to produce acid but the effects can last for up to 30 minutes. Less sugar consumed more frequently does greater damage to teeth than more sugar consumed less frequently. Dental erosion is a type of tooth decay that results from acidic liquids contacting your teeth. 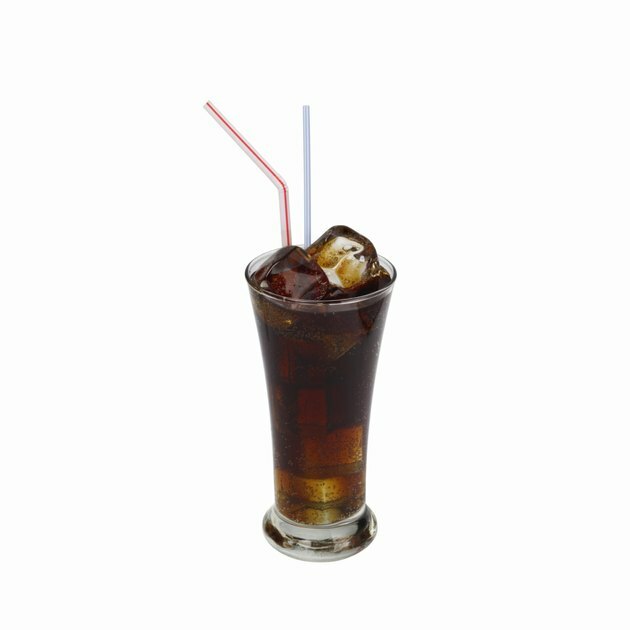 Soft drinks such as Coke and Diet Coke contain phosphoric acid, an acid that is used in industrial cleaners. Erosion from phosphoric acid affects the entire tooth, unlike localized erosion that leads to cavities. Coupled with the acid produced from bacteria, Coca Cola is a double threat to tooth enamel. Symptoms of dental erosion include temperature sensitivity, pain, transparency, cracking and darkening of teeth. Carmel dye is used to create Coca Cola's signature deep brown color, but doesn't actually add to the flavor of the soft drink. Carmel coloring contributes to yellowing of your teeth, and weakened enamel makes it easier for teeth to become stained. Yellow teeth are unsightly, but don't actually affect your health. Tooth decay may be prevented by limiting consumption of Coke and other soft drinks. Ross advises drinking soda with a straw to minimize its contact with your teeth. Brush your teeth immediately after consumption to prevent staining and to neutralize acids.